In country where when asked who is to blame for the nation’s economic predicament, 78% say Wall Street bears a “great deal or a fair amount of blame”, it isn’t often you hear such an honest testament from a Wall Street executive. In a timely op-ed published in the New York Times today, Goldman Sachs Executive Director Greg Smith publicly resigned. But not before giving us his true sentiments about the company he has worked for since he was a summer intern while a student at Stanford. “I believe I have worked here long enough to understand the trajectory of its culture, its people and its identity. And I can honestly say that the environment now is as toxic and destructive as I have ever seen it,” he begins. He goes on to detail how the interest of the clients are being ignored more than the NBA ignored Jeremy Lin when he played for Harvard. This isn’t how it has always been, Smith explains. Over the years he has recruited and mentored internship candidates through a taxing interview process created to weed through the thousands of applicants. Out of those, Smith managed 80 students who made the cut as summer interns in 2006. Smith doesn’t try to sugar coat the downfall of the firm’s “moral fiber” either. He assigns blame–namely, current chief executive officer, Lloyd C. Blankfein, and the president, Gary D. Cohn, for losing the culture that he claims made him love working for the firm for so many years. So is Blankfein really all about the money? 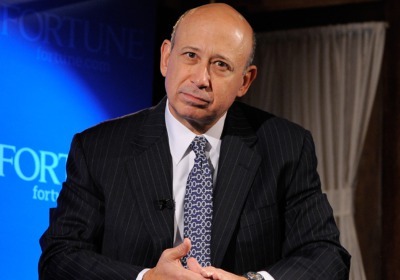 In 2011, the New York Times, reported Blankfein’s compensation for 2010 came to $13.2 million. A list of CEO pay compiled by Forbes puts former CEO Henry Paulson Jr at $16.4 million in 2006. In 2006 Blankfein earned $54.4 million as one of the highest paid executives on Wall Street and named one of the most outrageous CEOs of 2009 by Forbes. In 2005, the NYT reported Paulson walked away with $37 million in shares and options. Sounds like this is the culture Smith is referring to. So where did it go? In 2010, Blankfein testified before Congress that he believes Goldman Sachs has no moral obligation to tell clients it is betting against a product it is asking them to buy. Goldman Sachs has been criticized by lawmakers, pundits and Wall Street for those practices Blankfein admitted to. Could this be the beginning of a move towards the values and standards Smith and others on Wall Street used to uphold? → Today is National Grilled Cheese Day. Here are some of the cheesiest photos from around the web I could find.